European cities are generally excellent in having a multitude of museums to visit and while Barcelona is no Paris, it has its fair share as well. But, one of the museums that is often overlooked is the Barcelona City History Museum. Located in Plaça del Rei, the first floor isn’t terribly mind blowing, consisting of various artifacts from the 2,000+ years of history that Barcelona has seen. It’s a nice collection, but nothing worth a heavy recommendation. It’s only once you set foot in an elevator with “2013” on a display inside of it that things get interesting. As it goes down, the years reduce until you arrive at the beginning of the Roman Period. 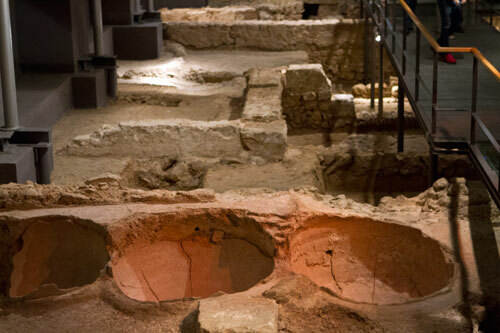 You step out and you immediately set foot in to the Roman foundations of old “Barcino”. This, is amazing as you first wind your way through various old homes and dye shops. Near the end of this large, excavated cavern that sits below Plaça del Rei you come to what was an old Roman cellar. This shouldn’t come as a surprised given that winemaking facilities are everywhere under Barcelona, but taking up some 400 square meters of this space, it is a fantastic display of how wine used to be made back when Jesus wasn’t available to extract it from water. Important to note are the old amphorae that are still largely intact as well as the various explanations of how the wine was actually produced. Something to especially interesting is that no matter how many people keep trying to state that not filtering wine is better, the Romans were indeed filtering it and it was most likely for the same reason that we do today in that a glass of sediment ain’t pleasant. But, for anyone passing through Barcelona, while there are of course countless sites to see, if you’re a wine lover, this a mighty fine one to fit it–that and during the summer, the ruins offer a nice break from the heat.